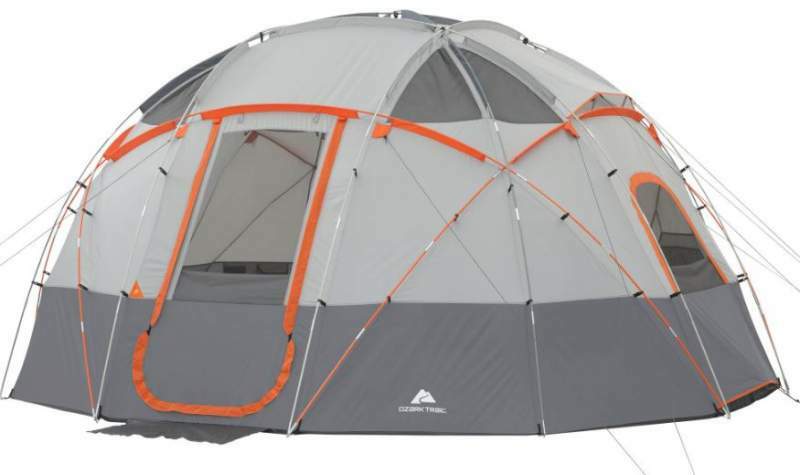 Ozark Trail 12-Person Base Camp Tent with Light is an incredibly affordable freestanding dome structure for summer camping, with 8 windows and 2 doors. Ozark Trail 12-Person Base Camp Tent with Light. 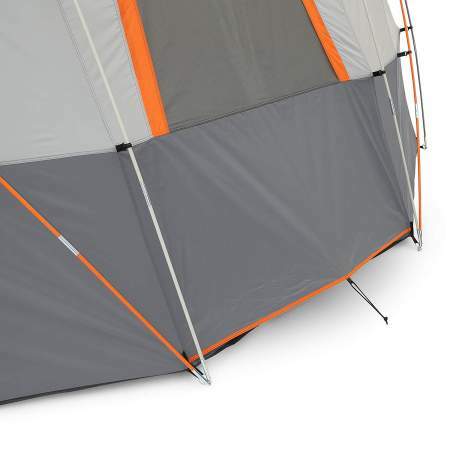 This tent has appeared recently on Amazon and I have noticed it on a couple of their global stores. So check the link and see if it is available in your national Amazon store, you might save on shipping. This 12-Person Base Camp Tent is a part of their new series that includes also tents for 9 people and for 6 people, all built in the same style. This is a simple single room construction with 16 ft diameter. Note that the manufacturer uses the name Ozark Trail 16 x 16 Sphere Tent at their site. As you realize from the pictures this is a fully freestanding and dome style tent, the poles are added from outside and you have no extra fly here. So this is a single-layer construction. Note also that this is an incredibly tall tent with 92 inches (234 cm) peak height. You will not find many taller tents on the market. I have included it in my list of very tall tents for camping. In fact, to the best of my knowledge, this is the largest dome style tent currently available on the market. I have never seen a bigger dome tent. So I have added it to my list of extra large family camping tents. So this built-in light system is a great bonus here. You have settings for high, low, and medium light, and the system is powered by a Universal Power Bank or batteries. The picture below shows the ambient. 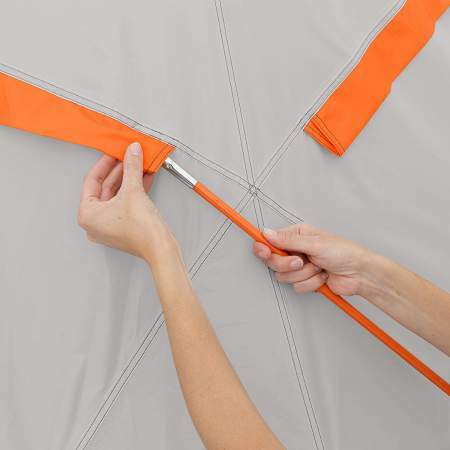 Because of this feature, I have added it to my list of lighted tents. Inner view with the lights on. Capacity-wise, the tent is declared suitable for 12 people but this number is not realistic for a real camping because you do not have any storage area here. But the total floored area is indeed huge, 201 ft² (18.7 m²), and this gives 16.7 ft² (1.56 m²) per person if used by 12 people. So I would say it is for a maximum of 6 – 7 people or so if used for camping. But a group of friends on a summer festival or an open-air concert would manage to put 9 pads on the floor. In view of its diameter, it can easily accommodate three queen air beds. Seasons-wise and climate-wise, this tent looks like some of these expedition tents, but in fact this is not such a tent. What you have here is a summer camping tent for quiet weather conditions without much rain. The manufacturer describes it as a 3-season tent but I would not take this seriously. The structure is with so many poles that cross each other numerous times and this makes it very strong against the pressure from any side. So indeed it will behave well in the case of winds. However, what is missing here is a full coverage fly and this would change a lot. As it is, with so many seams and with zippers on numerous windows and doors, this tent should not be used in a rainy area. This tent is so affordable and it really looks cool so that it makes sense buying an extra tarp and put it above as a rain shell. You have some nice tarps from Kelty that would do the job, check this Kelty Noah’s Tarp Sun Shelter, the largest is a 20 x 20 ft square. It would not go all the way to the ground because the length of such a half-sphere is around 25 ft, but if you spread it like a roof and fix with guylines it will do the job. Weight-wise, with its 49.08 lb (22.3 kg), this is a heavy tent with the Area/Weight ratio 0.84 m²/kg, but this is not surprising in view of so many poles. You will see how it stands when compared with some other tents in the same size range. One thing is certain, you would not want to change your camping place frequently with such a tent. There are many poles and sleeves here. There are 10 poles in total here and this is fiberglass. This is why the tent is so heavy. Six of them create the dome and four go around adding to the stability so you have many cross points. Everything is color-coded and you have three different colors for the poles and sleeves. The fabric is polyester and this is pretty much all that is provided by the manufacturer. So this is very disappointing, to say the least. There is no indication whatsoever about waterproof rating and as I said above better avoid the rain. You have mesh and panels on all the windows and doors. 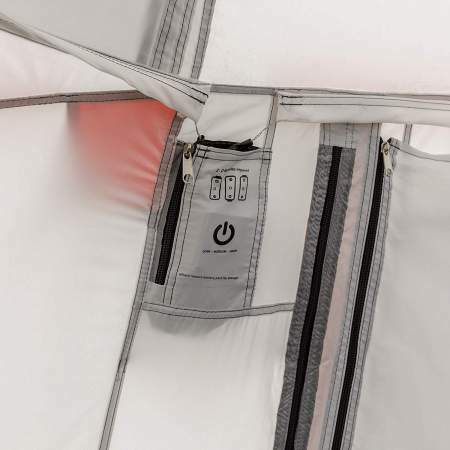 Surprisingly, zippers are on all panels and this is what you would not expect in such an affordable tent. But this was a must in view of its dome structure, otherwise panels on the curved windows would not close the space. One of the two floor vents. This tent has many windows with mesh and panels, but if it is raining you have to keep them with panels. So it must rely on vents and you have them here 4 in total, 2 floor vents and 2 ceiling vents, one pair on two opposite sides, one floor vent is shown above. They are with mesh and zippers (you need to unzip the mesh to raise the Velcro stiffener), so this is well done, no objection here at all. This is the light control unit. Media pocket and storage pockets. 26 Steel tent stakes included. Organizer with media center and multiple pockets is included, see the picture above. Several mesh pockets on the walls. Lantern loop on the ceiling. Electric cable port is available close to one of the doors. This tent is on Amazon with the price tag of $165, so I find this amazing. My average rating is shown below, as you see it is high but bear in mind what I said about rain protection. Weight: 49.08 lb (22.3 kg). Diameter: 192 in (16 ft; 488 cm). Area: 201 ft² (18.7 m²). Area per person: 16.7 ft² (1.56 m²). Peak height: 92 in (234 cm). Packed size: 29.1 x 11.4 x 11.4 in (74 x 29 x 29 cm). Obviously, there are no other similar summer camping tents to compare. So I have decided to show this tent side by side with two other 12-person tents that are also summer camping tents but cabin-style. This might give you some idea of the advantages and disadvantages of the two different styles. 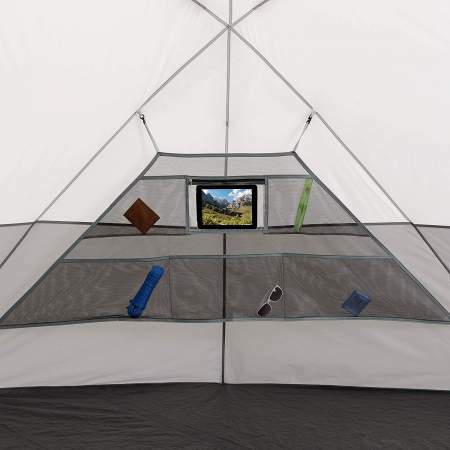 As you realize they all are heavy, but the Core tent is with an instant setup, and those cabin tents have rooms as compared to the one room in the Ozark Trail tent. But the other two are very expensive tents, at least in comparison with this tent here which is incredibly affordable and worth considering from this point of view. It is easy to get delighted when you see such a structure like this Ozark Trail 12-Person Base Camp Tent with Light. This is even more so when you see its price. But to make this a reliable tent it is necessary to add a fly, as I have suggested above, a large tarp or anything similar will do the job. So do not make a mistake to compare its price with some of those expedition or winter tents that look similar in style. I have seen some people doing exactly this, but this is a big mistake. If you need more options in the same size range, check my list with 12-person tents. Note that this is not a sponsored text and I am not paid by the brand.